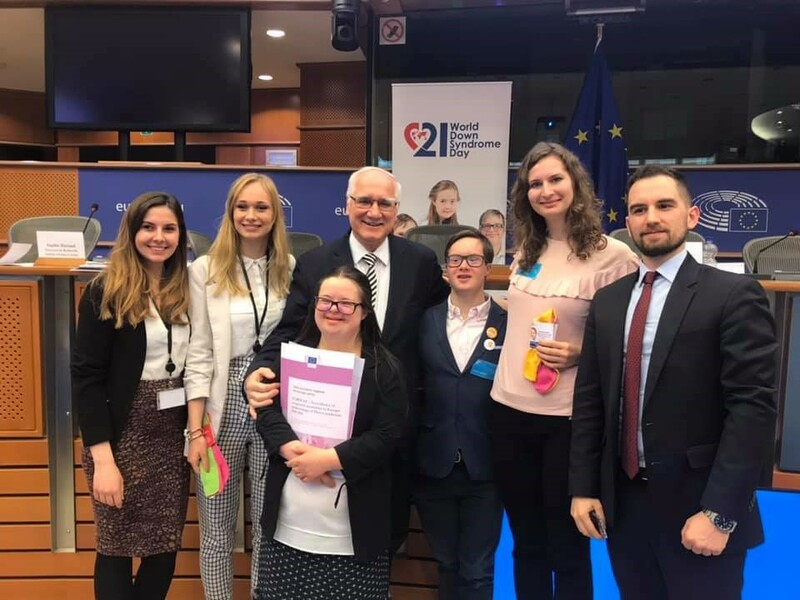 20 March 2019, Brussels, Belgium – Last Wednesday, the regional office of the World Youth Alliance Europe attended the Leave no one behind conference in the European Parliament to destine 50 million euro to the research on Down syndrome to reduce disability and improve independence and inclusion and to celebrate the 21st World Down Syndrome Day (WDSD). The event was organized from MEP Miroslav MIKOLASIK, in collaboration with the Jerome Lejeune Foundation and WYA Europe, under the patronage of the EP President Antonio TAJANI and of several political groups. WDSD represents a global awareness day officially recognized by the United Nations since 2012. Besides many speeches and a video clip in which researchers and Down syndrome experts explained their work and the multiple paths that this research is producing – inter alia, developments for Alzheimer’s disease – , Marie-Joelle BEAUCLAIR and Emmanuel LATIL were both giving a small speech about their life with Down Syndrome. Both of them were underlining how satisfied they are with their life and claimed not to leave anyone behind which is the message of the official Down syndrome campaign slogan. WYA defends human dignity in all its phases and conditions of life, it was hence crucial to give our support and our contribution to keep up with the last results and political points of views around the topic. WYA recognizes the importance of protecting every human being’s dignity. Take a look at the Declaration on Human Dignity and Bioethics to find further insights on the topic.